A few weeks ago, the Board for the Fairfax County Public Schools voted to implement a new master calendar. We had mentioned it on our Full Day Mondays post. At the time, the Board had made the decision to implement Full Day Mondays. However, there seem to have been a lot of push-back from teachers and school personnel regarding the lack of teacher planning time with the new schedule. The teachers seem to have made a strong case for their lost planning time with the new schedule, so the Board analyzed the situation and voted to adjust the master calendar to allow for enough teacher planning time throughout the year. The new master calendar means that there will be several days in the year where the kids will have student holidays (1-2 per month). For example, the Monday right after spring break (in April), or a Friday-Monday long weekend at the end of January. The extra days off could be great news if you are hoping for a cheaper airfare coming back from the beach, if you want a day off to do laundry and decompress after coming back from vacation, or to take several mini-vacations throughout the school year. Maybe it’s a reminder that you need to line up child care for those days when you’re working but the kids are off school. 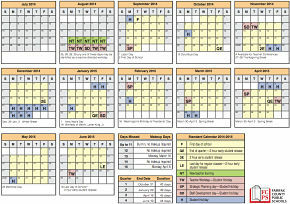 Fairfax County Public Schools Standard Calendar 2014-2015 – click to download a visual copy of the calendar.